Grove Street. Catch a Cart, Cab, Omnibus or a Train! 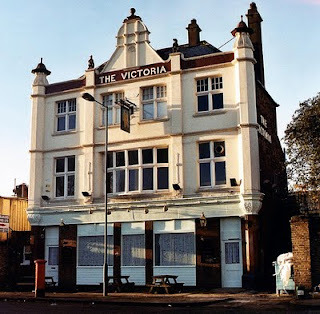 The Victoria, Grove Street Deptford. 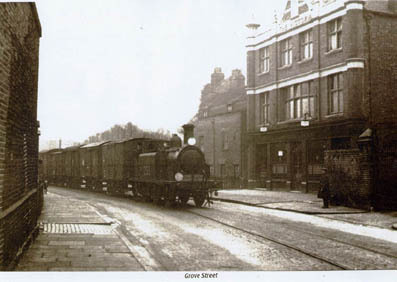 Great photos of trains coming up Grove Street. Was it going to the Cattle Market? I beleive the pub shown here on the right Is "The Victoria" Matt Martin "The True Londoner" should be able to help out here, and he has with permission to post his later photo of the Victoria. My thanks to him. 1914-18? Any ideas what the building in the left forground was? ..No... train was coming FROM the Cattle Market. is on the corner of Hanlon St.It may have been at one time, Scotts a paper bag factory.I remember it well at the beginning of the war,sandbagged up,empty, and a target for local boys competing to smash the highest windows with pebbles.Shop on the opposite corner was,in my day, a receiving office for a bagwash laundry. This is correct as i lived in halon st. My mum use to take our sheets to bagwash. PS.by 1934, it was the Diploma Laundry. I thought the train went into the victualling yards at the end of the road. My dad lived there before the war. Fantastic photographs of the trains in Grange Street . Then it got even stranger when I saw the newer picture of the Victoria pub as I have a copy of it from the same web site . The web site also lists some of the landlords and in 1915 it was Charles Pengelly a cousin of my Grandad !. The small world got even smaller when I found out my Grandfathers Grandmother Eliza Twitchett(Digby)had lived at 184 Grove street in 1891! Still fascinated by the Grange Street photographs and had to find out more . Victoria pub on your left, swivel right, Scotts , the views look very similar to the photos. I think the photos were taken one after the other ,train coming towards us click,turn right, train going away click. according to Wickapaedia that is what the military bought when they had their depot there?? Paul, I think 184 Grove Street may actually be the old pub, which still stands but is no longer open. I live in 'Scott House' as it now is, sitting in it right now in fact, and it is number 185. There is no other building between us and the old pub building, only the scrapyard entrance. It's very strange to see my flat in that old photo. I love that this place has some history. 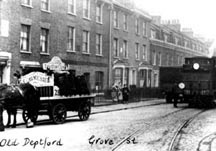 Number 184 Grove Road was nearer to you than the Victoria pub at 177, it was opposite Scotts on the even side of the street. I have just realised ! that means the buildings to the side of the photographer therefore are where the other half of the family came from. 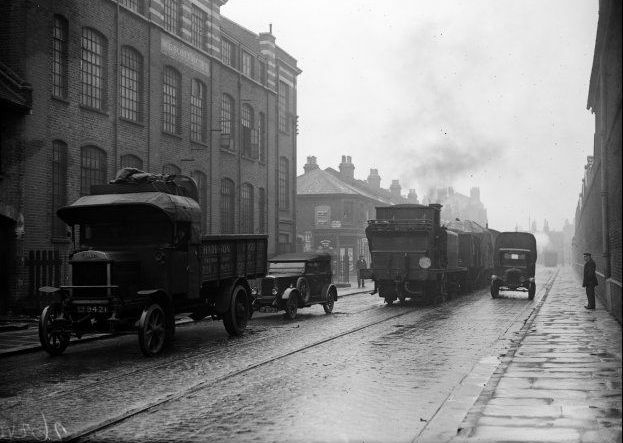 My parents lived with my grandparents in Hanlon Street which is the left turn just past the factory, after WW2. I was born there and remember the trains running down the street. It is correct that they ran into the Admiralty Victualing Yard which was where my grandmother worked. The factory was a laundry and the corner shop which can just be seen on the opposite corner of Hanlon Street was the laundry shop. The Locomotive is a London and Brighton and South Coast Railway Class D1. My Nana worked at 217 grove st in 1932. She was a supervisor at a tin making co. Does anyone have info on the company? I have 2 ancestors one born when family living in Grove Place and the other when living in a house on road to Grove Street. The years were 1797 and 1798. Does anyone have knowledge of these places, please? No. 27, 29 and 31 Albury Street. 1930's ? 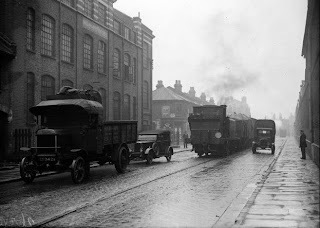 East end of Albury Street. 1960's-early 1970's ?